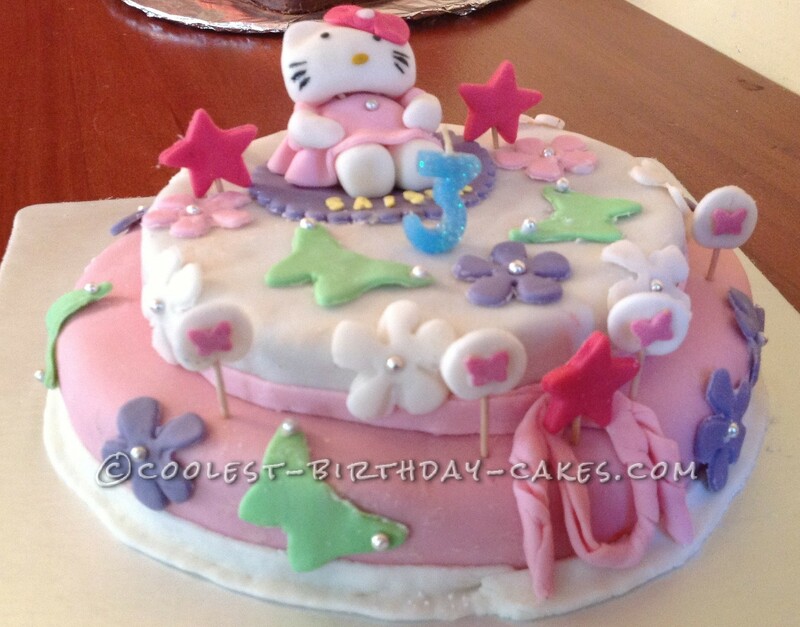 This Hello Kitty Fondant cake was my 3 year old daughter’s second cake on her list. First one was Tweety. She said she wanted a sitting hello Kitty that looked real. Now this was another challenge for me. That was only possible with fondant which I never worked with. I looked into many sites that teaches homemade fondant and how to tutorials. Got ideas but wasn’t sure if I could put it practically. I made marshmallow fondant at home. Pink and white. Made two cakes and tiered them. Used both colors of fondant to cover each cake. Made Hello Kitty which was amazingly very easy to make out of fondant! My daughter could not stop admiring it. When the time came deco tartrate the cake my girls were giving me all sorts of ideas which really made the cake a mess. I stopped there and thought would do when they go to sleep. It was late at night and I was tired too. Brains not working and needed the cake next day. My husband came in and asked if I needed any help. I said yes I did. He has never worked with cakes and had no idea on how to. He saw how I was rolling the fondant and making shapes. He took over from there. He made flowers and butterflies and stuck them on cakes, made ribbons and bows and also make cake pops that looked amazing! We put the Hello Kitty and it was ready so fast! I couldn’t believe that! So two tired minds also work in a better way and come up with interesting things like this!